AMW Bulletin: HBC 3-Day Member Sale! 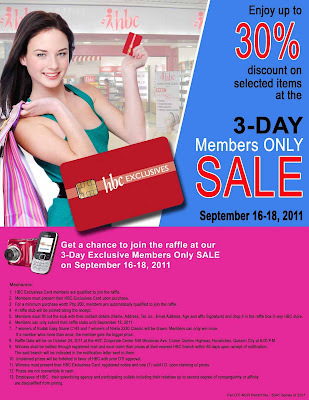 HBC sells good quality products at an affordable price and yet, they are still giving out up to 30% off on selected items at the 3-Day Members Only Sale --- That's September 16-18,2011! Lucky to those who have HBC stores nearby their home or office! Enjoy shopping!